This entry was posted in Uncategorized and tagged Health Care by Kirk Petersen. Bookmark the permalink. 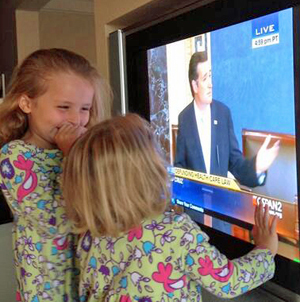 Ellie has the same nightgown as Ted Cruz’ daughters. We’ll make a Republican out of her yet! I’ve studied Obamacare, the new guidelines in action, and it looks pretty good, I think it will be popular. I would pay attention to arguments about people saying that something doesn’t work, but the arguments I hear are more like people can’t understand it, and it hasn’t even been rolled out yet nor has it been scheduled to before October.